Charco de los Ciclos, Timanfaya National Park. Photograph by Miriela Rodriguez, Wikimedia Commons. Through channels most convolute and mysterious a request came into my hands for a guide to the volcanism of Lanzarote for a young man called Luke. Feel the volcanic force, young Luke! As Africa and South America broke apart and the South Atlantic started to form 106 million years ago there was a lot of volcanism along the entire line. One of these places was where the Canary Islands would form. Most of that old volcanism died down and today only the Canary Islands Hotspot and the Cameroon Volcanic Line remains. Both are upwellings of deep warm mantle material that easily melts and creates volcanoes to form above them. The Canary Islands consist of 7 volcanic Islands, from east to west these are Lanzarote, Fuerteventura, Gran Canaria, Tenerife, La Gomera, La Palma and El Hierro. From east to west there is a trend with the islands becoming younger as you go. Fuerteventura is oldest with its 22 million years and youngest is the 1-million-year-old El Hierro. Lanzarote is the second oldest island at 15.5 million years. Many of the older islands had an initial phase of intense volcanism as the islands formed, before they for reasons unknown stopped erupting. Fuerteventura stopped erupting 11.8 million years ago and restarted erupting again 5.1 million years ago and the same figures for Lanzarote is 5 million years ago with a renewal 3.7 million years ago. The reason for the pauses is one of the major mysteries in volcanology and hopefully some young volcanologist will solve it in the years to come. Volcán Timanfaya. Photograph by Miriela Rodriguez, Wikimedia Commons. The island of Lanzarote is a large volcano, counted from the bottom of the ocean it is 3 200 meters high, even though the island is fairly low. Large parts of the island have been eroded by weather and wind, and it is only about half of the island that is covered in young volcanism. After the volcanic break the eruptions has been small and far between up until 22 000 years ago when eruptions both became larger and more frequent. Locally the volcano is called Timinfaya, but that is not entirely correct since the entire island is a rift volcano. In fact, the volcano is larger than the island. Between the island of Fuerteventura and Lanzarote the water is only 40 meters deep. That means that during the last ice age when a lot of water was bound as ice and the ocean level was lower, both islands where connected in a very large island that was 200 kilometres long and covered 5 000 square kilometres. The reason for this is that both Lanzarote and Fuerteventura is sitting on a crack in ground that is called “The African Rift”. It is through that crack in the ground that magma rises and comes out in large eruptions as lava. It is believed that one day there will be a large eruption between the islands and that they will once again become connected. Eruptions in Lanzarote tend to happen at many spots in the island, and each spot tend to erupt once or twice before moving on to a new place. This is of course a problem for the locals and the people who work with predicting eruptions. If an eruption would be coming, the volcanologists would be able to warn about it in advance, but there would be a problem telling where on the island the eruption would happen. And since nobody wishes for a volcano to come through the ground under their house, the authorities would have to evacuate a lot of people before the eruption started. Volcanism at Lanzarote started approximately 35 million years ago, but the first twenty million years was below the surface of the water. During this time, there must have been thousands of eruptions to build up this giant of a volcano. Geological Map of Lanzarote. Image by A. Hansen and C. Moreno. Used under fair usage act, and linked at the bottom of this article. The sub-surface activity was mainly happening at the centre of the current island. As volcanism started to form the island most of the action was instead at the southern end of the island in the beginning. This island forming eruption was truly colossal and built up a very large conical island with softly sloping sides, something that is called a shield volcano. It is estimated that this eruption lasted for 1 million years. As such it is the eruption that lasted the longest time that we know of. Almost all of this ancient volcano is now destroyed by wind and waves. This ancient island of Lanzarote is called Los Ajaches. Remnants of it can still be found hidden under more modern layers at the southern end of the island. After that there was minimal volcanism at Lanzarote for 3 million years before the Famara Massif was constructed. This part is still the highest area in Lanzarote at 671 meters above ocean level. This eruptive sequence consisted of many large and small eruptions over 6.4 million years. These two islands were in turn glued together by volcanism that occurred at the centre of today’s Lanzarote. This much smaller volcanism occurred during the latter half of the formation of the Famara Massif. After that further volcanism has kept the island in shape and has lately been building up the size further. Some of these eruptions have been pretty large, but not on the same scale as the initial eruptions. One of the massive craters of the 1730 eruption. Photograph by José A. Duarte Llorente, Wikimedia Commons. During the last 2 000 years, almost all large non-explosive volcanic eruptions has happened in Iceland. One of the few exceptions to this rule can be found at Lanzarote. On the 1st of September in the year of 1730 a 13-kilometre-long fissure opened up in the central parts of the island in what is today known as the Timanfaya National Park. In the beginning lava fountained up along across the entire length of the fissure, but soon the activity became centred around a few craters. The lava flow was so large that when it entered the ocean it did so over a 20-kilometre-long stretch of the coast. It must have been an amazing sight watching lava falls pour down over the cliffs with huge clouds of steam forming as the molten rock superheated the water. This is also the longest historical eruption in the Canary Islands, it lasted for almost six years, until it ended on the 16th of April 1736. By the time it was finished, almost 5 cubic kilometres of lava had poured out of the tormented ground, covering 60 square kilometres of ground. The 1824 eruption is the last eruption in Lanzarote, at least so far. It occurred in the northern parts of the island. It started on the 31st of July 1824 and was concentrated at the Volcan Nuevo, Tinguaton and El Clerigo Duarte volcanic centres. Even though this eruption was quite a bit smaller, it is still a very interesting to visit since it gives a good idea of how a future volcanic eruption could reshape the island. Cueva de los Verdes Lava Tube. Photograph by Luc Viatour, Wikimedia Commons. The highest point in Lanzarote (671 meters) is the remnants of a volcanic eruption that was too hard for weather and wind to destroy. It is called Peñas de la Chache and is in the north. It is a remnant from the Famara Massif. Another nice part to go and visit is the largest remaining volcanic crater, it is called Volcán de la Corona and is in the middle of the island. This volcano erupted 21 000 years ago and created a lot of new land and some of the largest volcanic tubes on the planet. The eruption was one of the largest effusive eruptions in the last 100 000 years, only to be rivalled by the Icelandic volcanism. Visiting the Timanfaya National Park is a really good idea since one can still to this date see residual effects of the truly awesome 1730 eruption. Cueva de los Verdes Lava Tube – This is a must to visit. It is the world’s largest intact lava tube. It came from another large eruption that occurred 21 000 years ago from Monte Corona. The lava tunnel is 6 kilometres long below ground. On top of that it extends a further 1.5 kilometres below the surface of the ocean, a feature called Tunnel de la Atlantida, a heaven for divers. This is in my opinion a must for any volcano friend. Just imagine standing in this great cave thinking about all the lava that gushed through the tunnel. It is one of the natural wonders of the world. Very good oh, Jedi Master of the Dragonlands…. When I was a kid I read a book on the Canary Islands. must’ve been my Barbadian ancestry on mom’s side. I’ve read… somewhere, that the spacing of the islands may be related to crust flexure from the mass of the islands weakening a point roughly where the next island formed. I don’t think it was a Caracedo paper, but Caracedo has some of the most authoritative material on the Canaries vulcanism. Anything he has written is the “go to” paper to read. I reiterate, this is my opinion and does not represent the position of Volcano Cafe, official or otherwise. Now, “Bob” has a new name. Since May 2016, the volcano is named “Tagoro”. I stayed over at my best friend’s house in Manchester just on thursday night, it’s scary. Good to hear you’re ok Albert. It is despicable that they go after the young and those who are interested in music. Further evidence of their cowardice. Touching, and lovely Albert. Nicely said. Just a heads-up, Erik Klemetti is being dropped from Wired next week, so now is the time to catch up on his posts before they are possibly lost! As with all things, it probably made sense at the time. Personally, I can state that the reason I stopped following his articles was because of Wired’s interface and nothing else. You never knew what kind of weird code snippet they were gonna stick in the web page. I don’t mean this in a negative way (blogging takes a lot of time), but I wouldn’t be surprised if he was getting a decent amount of pay to blog for Wired. I know he got a bit more from Wired than previous. And a team of volcaholics! Here at http://biblicalgeology.net/blog/canary-islands-formed-late-in-noahs-flood-and-afterwards/ “The Canary Islands formed late in Noah’s Flood, and afterwards” a creationist view about the development of the Canary Islands. We do science in here, not unfounded superstition. Well, I respect your right to your opinions. But I didn’t think the bible was written to be used as a geology text book. Biblical geology might make an interesting post, but it would be based on modern science to explain the old observations. From a philosophical standpoind I kindly disagree somewhat. I respect someones right to have a religion, but I will not respect a so called “theory” based on falsified data and misleading logic. I will call creationism for what it is; The largest lie in the history of mankind. If we erased all religious and scientific knowledge and started from scratch, all of the science we know would eventually be restored but none of todays religions would come back in the form they are in today. You could argue the same for art, music, culture. It doesn’t mean they have no value. And science also changes over time. Some subjects like a mechanistic model (much of biology does this), others go for probabilistic modes (some areas of physics) or for patterns and networks (computer science, ecology). There is culture in science. Not in volcanology, of course – that is completely factual and non-emotional. (Ok – perhaps not quite!) I have always liked to combine different field of science, and you do note the different ways of thinking, and how they change over time. The difference is that the arts do not purport to be a natural science. And yes, science changes over time, it does that on a mixture of trial and error and falsifiability (preaching to the master here 🙂 ). The difference here is that the same evolvement is not true of faith based world-views like creationism. I am not saying that religion may not have a value for those of the faith. I am just questioning the value of using faith instead for science in the parts of life where science is far better suited. Personally I enjoy looking at our existence through the filter of the arts as well as science. And I do enjoy pondering world-views, even though I prefer the world-view of Fredkin over the Bible (personal choice on my part). Some parts of those two views even intersect, for instance in relation to the soul. Sure. Especially in America science is seen by too many as ‘bad’. Even here in VC we have had comments from people not convinced by climate change, an issue where the science is not in doubt. And some scientists become scientific fundamentalists which doesn’t help either. I prefer Gould’s philosophy on how the two can co-exist. I do not in any way say that religion and science can’t co-exist. I have quite a few friends who do not have a problem with mixing the two in a way that let science explain nature, and religion for the private life. The key is to what questions each answer. Science (assuming appropriate data is gathered) answers the who, what, where, and when. Religion answers the why. It is always best not to confuse the two worlds. “who, what, where, and when.” Something the press seems to have forgotten about news. Most people don’t give a flying @#$@ about what the journalist’s version of “why” is. We’ll make our own “why” and don’t need some hack to tell us about their “why” because we don’t really care what they think. We just want the Who, What. Where and When. Beefing it up a bit, they could enhance the Who What Where and When with who is being prosecuted for it. That’s always a welcome side-note. Very interesting paper, and it says quite a lot about the difference between Deep origin plumes and shallow origin plumes like the Icelandic one. Haven’t seen one of those in a while..
Associated Press has reported a landslide over the weekend in Big Sur buried a portion of Highway 1 and believes it may become more frequent. If a VEI 5 has a total eruption time as quick as an hour, wouldn’t almost all of the eruption product be utterly pulverized and injected into the stratosphere whereas a VEI 6 eruption over several days would be more of a local event even though it is technically 100x larger? Kinda like opening a 250 psi fire hose bail for 30 seconds vice spraying my 60 psi garden hose for 30 minutes. Yes, the amount water from my garden hose is greater than the fire hose, but the pressure behind the fire hose is what REALLY matters. Is this scenario even geophysically possible, or am I once again over-thinking this? Not too much. It’s a valid question. The problem is that when a volcano erupts, after a certain altitude, the plume height is driven more by overall heat content of the ejected material rather than brute force. Mastin et al and the earlier Sparks papers (referenced in Mastin) both took this tack when coming up with the mass ejection rate estimate formulas vs plume height. This is also why you can get a pretty decent energy equivalent estimate by comparing to the plume height of an appropriate sized nuclear blast. A more likely effect that you seem to be looking for, would be chemical content of the ejected material. Some volcanoes are more sulfur enriched than others. Even a low VEI eruption that has a significant SO2 level is going to have a strong effect even if it doesn’t directly loft it’s entire load of SO2 directly into the stratosphere. 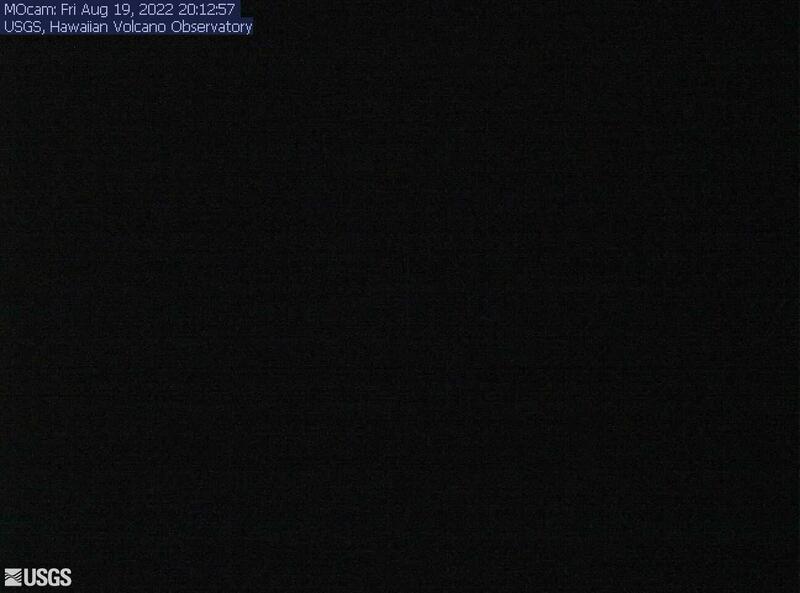 (Hello Kamchatka and Iceland) Also, how high up the stratosphere is for the erupting volcano will play into this. (changes seasonally) Tropical volcanoes have to deal with a higher stratosphere than those up around 60°North or South. Also, the global circulation patterns tend to have a more upward trend at this latitude, so even less energetic systems will have help getting the SO2 into the stratosphere. At that point, it boils down to diffusion rates across the tropopause, and my theoretical toolbox comes up empty because I have no idea how to calculate that. This is also the mechanism that I think allows Carbonyl Sulfide (COS) to get to the stratosphere and contribute to the background Junge Layer. 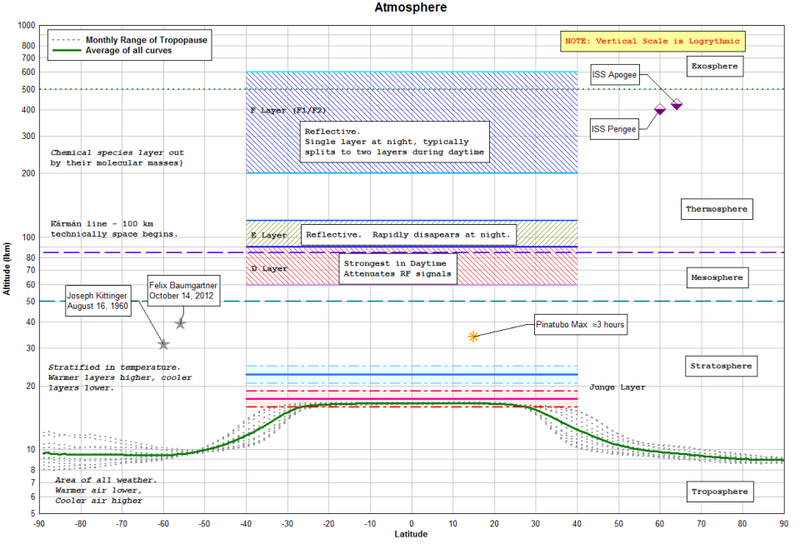 In the troposphere , COS is pretty stable and is a major player in the Sulfur Cycle of the biosphere. In the stratosphere, hard UV light can get to it and dissociate the COS molecule, allowing it to form sulfate particles when it react with any H2O that is present. Directly injected SO2 on the other hand, doesn’t need to be split by UV light to convert to sulfate particles. SO2 injections that load the Junge Layer take about 50 months to sediment out to pre-eruption levels. That’s a good 2 year window that cooling via large eruptions can give you. The conversion of SO2 injections into sulfate takes about 3 months to complete. And since I did that, I might as well toss in the other image that gives a few references about height. Thanks GL. Okay, follow up. Ice cores use pH and gas content to SWAG a VEI of a particular event and the chemistry in an attempt to fingerprint the volcano. If there were a small yet vigorous island eruption blasting through millennia of limestone corals that ALSO erased itself (thinking: Thera or Krakatoa) in some remote and uninhabited corner of the tropical Pacific or Caribbean pulsing a Naval Crap-Ton of SO2 that precipitated out in the cores, couldn’t that be mistaken for a much larger eruption and since it went the way of Atlantis, be difficult to locate today? …and, I like your explanation. But, pushing that much stuff out in a rather short time, the expected overall heat should be high. Kimberlite eruptions come to mind, but only sorta like that. A lot of stuff propelled through a small aperature at high speed, over a short duration. The shock would pulverize everything into talcum powered and if it is oceanic, take a lot of H2O with it. Dunno. The 938 problem may be easier that we may think. Something on the continental margin, tropical, and no longer recognizable or thought to be too small – like something offshore in the Veracruz portion of the Trans Mexican belt (The Conquistadors were nice enough to burn all the Mayan records from that time, so, “Way to go, Jerks!”). It’s also thought that gypsum was present at the Chicxulub impact site and the released sulfur pushed the KT extinction event into overdrive. The Deccan traps were active, so the extra SO2 load was probably icing on the cake. And, since gypsum tends to get concentrated as a precipitate in geothermal areas… well, there’s your volcano clue. Years of material concentrated on evaporite beds, volcano punches a hole through it and lofts the SO2… game on. Veracruz is a good choice. It sits right next to those deposits that the impactor hit. It should be sulfur rich in the underlying strata. The data I have seen suggests that significant climate effects (lasting a couple of years) requires a high VEI6 or more. VEI5 does not have enough volume. The energetics must be very important. Effusive eruptions have immense local effects but not as long-lasting and not as widespread: Toba is an example. Not as much reaches the stratosphere. Location is important. Equatorial eruptions affect both hemispheres. 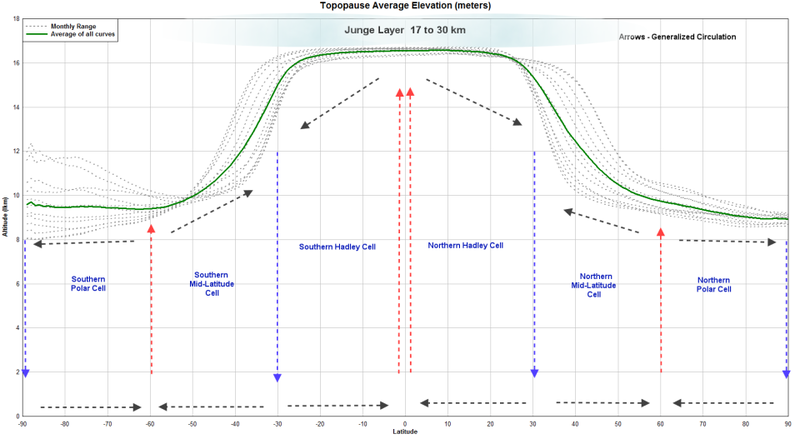 High latitude eruptions tend to get trapped behind the polar front and don’t go worldwide. A good example of your case regarding the energetics is Krakatoa, which probably had a large effect that it should have had, because of the violence of the eruption. A major effect comes from the sulphur in the rocks it erupts through. The KT impact was so devastating because it hit a sulphur-rich region. But I don’t think the 938 eruption is missing. It is Eldgja (re-dated from 934 to 938/9). You may refer to the second eruption at this time, which is now dated to 945 and is linked North Korea. The 1808/9 eruption is still missing, and a Pacific island would be a viable candidate, I think. With the 1808/9 eruption- wasn’t Rabaul a distinct possibility? A big eruption could easily be concealed by a shallow bay or ocean. Rabaul is a very bad one IMHO.. The emergence of noctilucent clouds (northern and southern hemispheres) following the eruption of Krakatoa has been a personal item of interest of mine for ages. That the frequency of noctilucent clouds appears to actually be increasing up to present, though, seems to belay the theory of some form of long-lived contaminant from a single source (Krakatoa) since it obviously has not been erupting all this time. So, piggy-backing onto Albert’s comment of Krakatoa being a particularly violent event that triggered more of a climatic effect than would otherwise be expected, IMHO, something else happened chemically with Krakatoa that has created an environment (or triggering a possible closed-loop system) suitable for meteoric dust to act as precipitate seeds (hence noctilucent cloud formation). 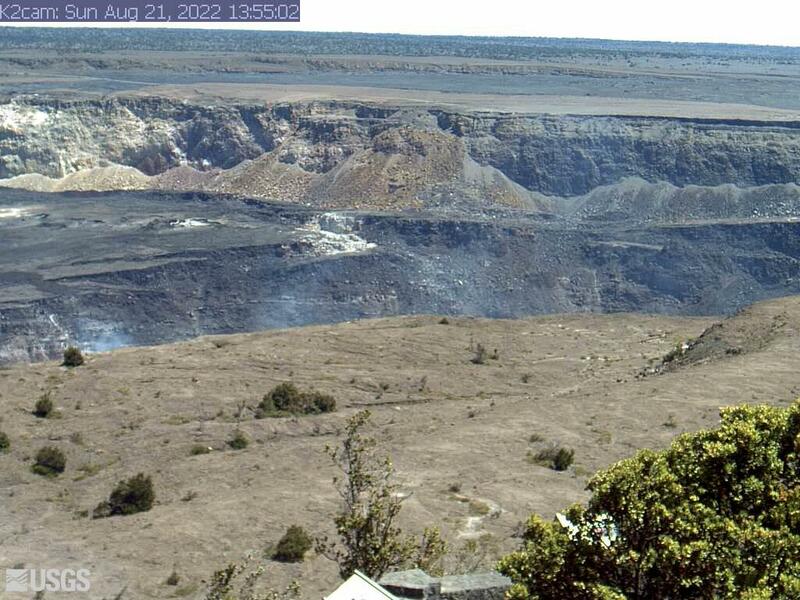 I haven’t seen it here yet, but there are more Mauna Loa cams!